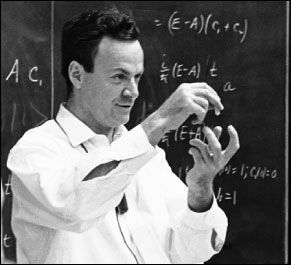 Richard Feynman, who helped develop many of the concepts in today’s post. The emptiest of space is not really a vacuum, though we call it that. Quantum physics has shown that the Universe is filled with a bubbling stew of fields—the stuff that ends up defining everything else. Particles themselves are manifestations of the fields, as well as their interactions. A free particle such as an electron flying between the stars won’t “feel” the fields surrounding it for the most part, because their effects mostly cancel each other out—any disturbance in one direction has a balancing disturbance on the other side. In other words, that free electron will not deviate from its straight path, just as Isaac Newton said centuries ago. But the fields are there, and manifest themselves when two or more particles come closer to each other. Different particles excite different aspects of the underlying fields, and those excitations are what we know as the forces of nature. Electrons interact with the electromagnetic force, so we say they are electrically charged; a neutrino is unaffected by the electromagnetic field. Both electrons and neutrinos are affected by the weak force, and so they are said to carry a “weak charge”. (The weak charge is more technically known as “weak isospin”, but the details aren’t important to understand the basic concepts.) Though there are many similarities, the forces manifest themselves in very different ways: the electromagnetic force carries over very long distances, while the weak force is short-ranged. The electromagnetic force is also about 10 million times stronger than the weak force (as we might guess from the “weak” moniker). What this means is that the electromagnetic field will have a much greater effect on a charged particle like an electron, making it relatively easy to affect its motion. Just as a ship moving through still water produces a wake, electrons create ripples in the ambient electromagnetic field. Those ripples are largest close to the electron and taper off over larger distances, becoming effectively zero. If another electron is nearby, the ripples they make will push the two particles apart. This is the quantum field version of the elementary school physics principle we all learned: “like electrical charges repel”. However, there’s a lot more going on! The ripples take time to travel between the electrons, so the interaction isn’t instantaneous. Also, they aren’t smooth waves like you get in water: they are themselves made of particles—specifically photons, particles of light. That makes sense: light is an electromagnetic phenomenon, that we can often describe as a wave, but its energy is carried in discrete bundles that manifest as points on a detector screen. The ripples passing between electrons consist of many of these photons of a variety of wavelengths, constantly being excited from—and reabsorbed by—the underlying electromagnetic field. Second, Einstein’s theory of relativity holds sway: a ship may be able to sit at rest relative to the water, but there’s no such thing as absolute rest in our cosmos. Everything appears to be moving from another perspective, and no perspective is more correct than another. That means electrons are always stirring up the quantum fields, even if we are observing them from a reference point where they appear to be at rest (that is, when we match speed and direction of motion with the electron’s). Third, the ship analogy works for repulsion between like charges, but we also need to deal with attraction between opposite charges. However, we can fix some of those problems simultaneously by playing with some of our ideas about time and space—Einstein-style. First, let’s take one ripple—that is, one photon—out of all the possible waves passing between the electrons. The act of producing the photon kicks the electron back. In basic physics terms, this is known as the conservation of momentum. (You can reproduce the effect by sitting in a wheeled desk chair with your feet off the floor, and throwing a heavy ball: you’ll roll backward as the ball flies forward. Obviously use caution if fragile objects are nearby.) The second electron recoils when it absorbs the photon, meaning both electrons are pushed apart by the exchange of a single photon. In fact, it doesn’t even matter which electron is the “emitter” and which is the “absorber”, since the amount they recoil is exactly the same either way you look at it. If it bothers you to have an asymmetry, just have them each emit and absorb a photon, as in the diagram. Like charges repel, opposites attract: quantum style. On the simplest level, repulsion between two electrons can be seen as the exchange of photons, which knock the particles off course. Attraction can be described if one of the particles moves backward in time, emitting photons that also move backward in time. Now let’s try something weird: let’s run the clock backward, but only for one of the particles. Now the particles appear to be attracted to each other: they started out apart, and end up closer together. This is because the photon from the negative charge “pushes” against the backward-moving positive charge, and the backward-moving photon emitted by the positive charge has a similar effect on the negative charge. This looks kind of insane, but it’s not quite as crazy as it seems. In electric wires such as those inside your walls, current is carried by electrons—but if you measure it, electrical devices pretend the current is actually carried by positive charges. The reason this works is that a flow of positive charges moving left looks like a flow of negative charges moving right, and vice-versa. 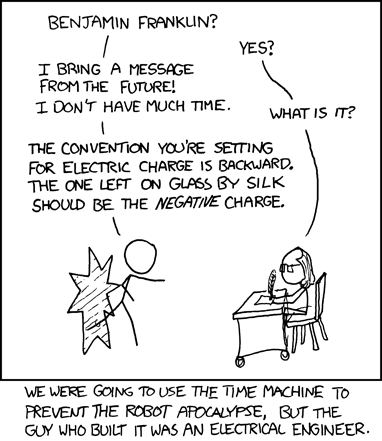 Similarly, the positive charge moving backward in time and space in our pretend scenario behaves the way it should for opposite charges to attract. Feynman diagrams of the same interactions in the previous figure. They are simpler, but they convey the same information. Of course, the exchange of a single photon is not how electric charges interact. To get the whole picture, you need to calculate all the ways photons can be excited from the underlying quantum field, and that can be a fairly intense process. (I didn’t learn how to do it until graduate school; quantum field theory isn’t typically offered on the college level, except perhaps to very advanced students.) To go back to our original metaphor, by looking at a single photon, we’re focusing on the biggest wave, while finding the motion of the ship would require looking at the smaller waves too—as well as how the waves overlap and interact with each other. The study of all the photons and their interactions with charged particles is called quantum electrodynamics (QED), which stands as one of the most successful theories in all of physics. The electromagnetic force is in some ways the simplest of the four fundamental forces. The weak and strong forces have an extra complication: the fields that carry them interact directly with each other. While photons are electrically neutral, the carriers of the weak force (the W and Z bosons) themselves carry weak charge, and the gluons that bind quarks together inside protons, neutrons, and the like also obey the strong force. Gravity, despite being the weakest force of all, is the most complicated: everything is subject to gravity. The subtleties of the other forces will play a role in later discussions, as we see how particle colliders and detectors do their business. Enjoyed reading this! Had a little bit of trouble parsing one sentence: “Particles themselves are manifestations of the fields, as well as their interactions.” It’s a little hard to tell if that means particles are manifestations of fields and field interactions, or perhaps particles and field interactions are manifestations of fields. Or maybe I’m just dense! Everything is a manifestation of the fields and field interactions – including the electrons themselves. I guess I didn’t emphasize that in the post – my apologies! Good description of the current standard view of QFT and always think it is good to make analogies and metaphors to help visualize. One point is that in everything mentioned here, we are talking about interactions between fields or particles to produce other stuff. That of course, is the way things function. However we have no way of knowing what, say, an electron is unless we introduce a probe. Only then can we “see”. However my view is that quantum mechanics is a theory of measurement that requires a probe field to interact. I think you should also try to imagine what a, say, electron spin is when no probe is present. Is it the same? Most people think it is, but what if spin is different when you turn off the field? Does it remain a point particle with a single axis of quantization? We cannot know because we have no probe. However it is clear that not all experiments can be exlained (EPR, Teleportation) and likely that is because our view of particles is restricted by measurement.